Reecastle Crag is one of those crags that only really came into its own in the 1970s when people began to train in order to improve their climbing standards. There were climbs here but they were mainly on the flanks of the crag: the central section remained inviolate. As fitness improved so eyes moved to this central, barrel shaped, part of the crag. The first to take advantage were Stuart Millar and Ray Parker who provided the direct start to The Rack. They failed to press home the attack and things were left to the following year for Jeff Lamb, who produced three class routes with White Noise, Guillotine and Thumbscrew. All were originally given E2 but general consensus has moved them up a grade, though Thumbscrew is easy at this grade. Things were then quiet for a while until Pete Whillance and Dave Armstrong visited and left with the hard Penal Servitude and the excellent Rack, Finger Flake Finish under their belts. The final wave of development had to wait until the late 1980s when Paul Cornforth, Paul Ingham and friends laid siege to the crag to produce a series of desperate test pieces. It had been fourteen years since I had visited the crag so when a day off work coincided with the middle of a fine spring spell of weather, a return was in order. Mike and John turned up at the house just after nine and a frustrating trip along the A65 followed as the traffic was just enough to prevent overtaking. We picked Cavall up at the M6 junction and arrived at the crag shortly after eleven. “Looks wet” said Mike. Cav & I exchanged glances: “It’s always that colour, Mike. Anyway it's only 5 minutes walk to check”. The five minutes showed that it was as dry as Cav and I had expected. The crag was in shade, which was hardly surprising since it faces North West and it was still mid-March. The air temperature wasn’t too bad so once we were warmed up the climbing would be great. Mike and John went off to do The Noose over on the right as a warm-up. I fancied The Finger Flake Finish E2 as I had only done it the once and that as a second. Soon the ropes are uncoiled, harnesses donned and shoes tightened. Time to give it a go. The initial entry into a bottomless groove is awkward but soon leads to the large ledge at 6 metres. A good piece of gear (shared with Guillotine) and then a tricky diagonally leftwards line leads to a niche where the original line of The Rack heads out left. If all that is only HVS then what is the E2 like? My fingers are cold from contact with the rock and I spend some time trying to warm them up. Above I see what appears to be a thin flake that should take a line sling. Unfortunately it is back on the ground with Cav. I lower a loop of rope to him so that I can pull it up. That done and with some warmth in my hands I am ready to move on. Mike Bullough on the crux section of Finger Flake Finish. A small wire at head height protects the first bridging move up the scoop to the thin flake. It won’t take the line: above and right I can see a well worn slot and beyond that, up and right again, what appears to be a good hold. A contorted move gains the slot then a quick move gains the good hold. Hanging from straight arms I can place a solid wire back down in the slot. The whole section of this crag bulges and I do not have time to hang around. Above is the finger flake itself: a series of good wire slots beckoning. A long 5b move gains the first slot where I find that my positioning does not let me steady to place gear, so its on to the next slot where the same situation presents itself. Before I know it I am at the top of the flake with the last gear 6 metres below me and still on slightly overhanging ground. To my l eft is a thin ledge, once there I will be back in balance, unfortunately I am wrong-handed and am forced into a further awkward and surprisingly delicate move to grasp a good incut hold. A quick shuffle and I am in balance. Gear is quickly forthcoming! 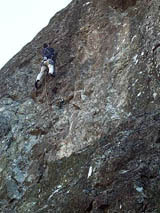 Above, the crag lies back and gaining the top is a matter of rockover moves onto sloping ledges. Finally the belay tree is at hand, a sling around this and I am lowered back to the ground. Cav wants to lead the route as well. This he does, though he puts a wire in the middle of my unintended run-out. The pitch is stripped, Mike turns up ready to do the route. Being less bold than either Cav or myself he places four runners in the flake! Caval Gregg on the upper wall of Thumbscrew. Cav fancies Thumbscrew over to the right. (Note that Cav has done the mid Extreme routes on Reecastle many, many times and knows them very well!) The initial easy wall to the right-end of the ledge is quickly dispensed with and soon he is placing gear in the bottom of the wall above. A long, long reach gains a downward pointing flake behind which goes gear. Cav's footwork is even worse than mine and he begins to scrabble. Suddenly he’s off and back at the ledge, muttering. The next go he gets the footholds in the right order and gets to a big jug, gear in the crack above this then a technical rock-over move allows him to stand on the good hold and place more gear. 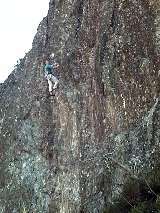 The upper section is vertical rather than overhanging and he is soon belayed at the top. I decline to lead it as I haven't led an E3 in years and really want to get footage in rather than fight on Lakes E3s. I get the crux wall OK, it's mainly a matter of walking the feet up little pockets. The rock-over move proves more tricksome as my foot zips off the hold and I just come onto the rope. The next time there is no mistake and I can get a rest above. The upper section is trickier than Cav made it look but before long I am basking in the sun at the top of the crag. Next up, after a lunch break, is Rack Direct. This really only 6 metres or so of independent climbing leading to the main crack of The Rack via a bulging wall. Given E2 5b it is bold rather than technical. A reasonable move leads to a Friend slot. Above looks a bit blank for 5b, but searching fingers find an incut or two enabling me to stand above the Friend. The next move is a long one for a good flake: jug on top and at the bottom! A tiring position though so I don't wish to hang around for too long. Mike Bullough on the crux section of Guillotine. More gear bolsters confidence to move again to hidden holds beneath the final bulge. A spike on the lip offers more protection from a sling before one of those disconcerting transitional moves from strenuous climbing to delicate puts me back in balance. Another couple of moves and I have joined The Rack. This leads pleasantly to the top. No-one wants to follow so I strip the pitch. By now Mike and John are on Guillotine with Cav providing a hold by hold commentary to Mike. Despite (or perhaps because of) this help Mike has to rest on the rope midway through the crux. Having rested once, he eventually takes two further rest higher on the route. I am surprised to learn that this is only his third Lakeland E3! Cav now wants to do White Noise, a route on which he has decked out more than once! It would appear that he has forgotten how to do the initial bold wall and it takes a few sorties before he moves up to the start of the diagonal crack that is the meat of the route and gear. The next few moves get Cav into heavy breathing mode. Suddenly, he’s off and onto the ropes. I lower him down and he spends a few minutes trying to get rid of the pump. The next attempt ends in similar fashion, as does a third. Cav admits defeat and offers me a go but I decline. My next choice is The Noose which Mike and John did as their warm-up. This is surprisingly steep, though on good holds, and I can tell that I am tiring rapidly. The sun is finally making an appearance and things become a little warmer. 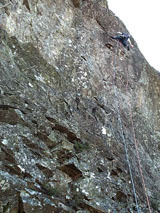 Our last route is Bold Warrior at the left end of the crag. Though given a star in the guide it would appear that it has had very little traffic. Mike leads it and is none too happy about the quality of the protection. He eventually gets to the top with not a little trepidation. John and I follow, this is to be the end of our day.